[AUTO] Limit Break 4 (This ability is active if you have four or more damage):When a «Gold Paladin» rides this unit, choose your vanguard, and that unit gets [Power]+10000 until end of turn, and choose up to three of your «Gold Paladin» rear-guards, and those units get [Power]+5000 until end of turn. ...so to start off this Liberator week, we have Gancelot...well...kinda. 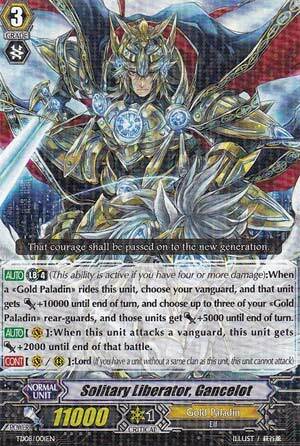 Basically, this is Liberator Gancelot, but most people will be familiar with this card as the Break Ride for Gold Paladins. When you ride something on top of Gancelot, then your Vanguard gains 10,000 power and 3 of your rear-guards gain 5,000 power. As most people would guess, this card was particularly made to end the game by the time you made the Break Ride as you are essentially giving your whole field a 25,000 combined boost, and in a late game scenario, combined with the correct Gold Paladin to ride this under (Platina Ezel mainly), then this can very well break the game for you. Also, whenever Gancelot attacks the Vanguard, it automatically makes itself gain 2,000 power, and that's enough for him to face off against Crossride units by himself! Combined with Tron, and he can possibly go attacking for 23,000 every turn without a Break Ride!!! With New York regionals in less than a week, I honestly wouldn't be surprised if we see a LOT of Gold Paladin decks using Gancelot! Art: 4/5 (Never was a huge Gold Paladin artwork fan aside from Blonde Ezel). Next Time: ...what's with the flute?? ?